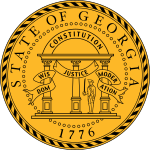 The state government of Georgia is the U.S. state governmental body established by the Georgia State Constitution. It is a republican form of government with three branches: the legislature, executive, and judiciary. Through a system of separation of powers or "checks and balances", each of these branches has some authority to act on its own, some authority to regulate the other two branches, and has some of its own authority, in turn, regulated by the other branches. The seat of government for Georgia is located in Atlanta. The main executive official in Georgia is the Governor. They are elected by the voters of the state for a term of four years. No person may hold the office more than twice consecutively. The governor oversees the state budget and thus possesses great power over all state finances. Additionally, the governor is responsible for the nomination of over a thousand officials to a variety of positions in state government, one of the largest rosters of any U.S. state. Those nominated must be approved by the state legislature. Regulations are codified in the Rules and Regulations of the State of Georgia. The legislature of Georgia is the General Assembly, a bicameral body consisting of the Senate and the House of Representatives. The Senate has 56 members and the House has 180 members. Each member of the legislature represents geographically distinct districts from which each voter may give support to one candidate for each body. For most of its history, the state used an unusual county unit system by which districts were drawn such that each had the same area. However, population growth in cities across the state led to the rural population, which was in relative decline, having disproportionate power in government. After the U.S. Supreme Court declared such unequal representation to be unconstitutional in Gray v. Sanders in 1963, state officials began to redefine legislative districts so that each had a similarly sized population. Both senators and representatives have terms of two years. There are no limits on the number of terms any person may serve. Its legislative acts, generically called "chapter laws" or "slip laws" when printed separately, are published in the official Georgia Laws and are called "session laws". These in turn have been codified in the Official Code of Georgia Annotated (O.C.G.A.). The highest judiciary power in Georgia is the Supreme Court, which is composed of nine judges. The state also has a Court of Appeals made of 12 judges. Georgia is divided into 49 judicial circuits, each of which has a Superior Court consisting of local judges numbering between two and 19 depending on the circuit population. Under the 1983 Constitution, Georgia also has magistrate courts, probate courts, juvenile courts, state courts; the General Assembly may also authorize municipal courts. Other courts, including county recorder's courts, civil courts and other agencies in existence on June 30, 1983, may continue with the same jurisdiction until otherwise provided by law. 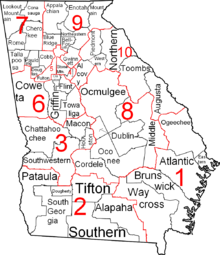 Each county in Georgia has at least one superior court, magistrate court, probate court, and where needed a state court and a juvenile court; in the absence of a state court or a juvenile court, the superior court exercises that jurisdiction. All serving judges are elected by popular vote either from the entire state in the cases of the Supreme Court and the Court of Appeals or from a given circuit in the case of Superior Courts. Judges of the Supreme Court and the Court of Appeals serve for terms of six years. Judges of other courts serve for terms of four years. The Georgia Constitution grants cities and counties a significant amount of home rule authority. Georgia is divided into 159 counties, more than any other U.S. state except Texas. Among all counties, 149 of them are governed by a committee made of between three and eleven commissioners. The other 10 counties are overseen by a single commissioner. All commissioners are elected by the voters of their county for terms that range between two and six years with most counties having terms lasting four years. Serving members wield both executive and legislative power in their county. Most of the 536 cities in Georgia are governed by a mayor-council system. All municipalities in the state are considered cities. Most basic public services rendered outside of the cities are provided by the counties. ^ "The Great Seal of the State of Georgia". netstate.com. Retrieved January 15, 2019. ^ "Elected officials". Retrieved January 15, 2019. ^ "PSC meet the commission". Retrieved January 15, 2019. ^ "Administrative Law Sources - Georgia Legal Research - LibGuides at Georgia State University College of Law". Georgia State University College of Law. Retrieved 22 September 2013. ^ a b c "Statutes - Georgia Legal Research - LibGuides at Georgia State University College of Law". Georgia State University College of Law. Retrieved 22 September 2013. This page was last edited on 13 March 2019, at 05:04 (UTC).